easyMarkets has just released its new interesting feature dealCancellation. You described the new risk management tool as an ‘industry game changer’. At first glance, it may have the ‘same taste’ of Buy-Me-Out feature that some binary options brokers offer to clients. Can you tell us more about the idea behind the dealCancellation tool? What kind of opportunities does it offer for forex traders? Trading can be a scary proposition for those new to trading. The idea behind dealCancellation is to help remove that fear by giving the trader the confidence to know that if they need to, they canget out of a losing trade. ORE, our options trading provider, and their patent pending technology* allows our traders to cancel a losing trade within the first 60 minutes after opening it. After its launch, we discovered that because of the sense of security that dealCancellation offers it encourages traders to open even bigger deals knowing they can actually cancel if it goes against them. In essence, dealCancellation allows a trader to cancel a losing deal – as if it was never traded. Same as cancelling a hotel room, or a flight. Imagine you have a losing position and that you can just cancel it as if your losses never happened. That’s what dealCancellation does. Whereas the buy-me-out option that some binary option companies offer, is just a feature allowing Binary Traders to get out of an open position based on current market data – they may still incur a small loss. The fee to use deal cancellation is calculated before the trade is opened and most importantly does not depend on the P/L of the deal. dealCancellation is enabled on forex majors, some commodities and indices. We will add it to more of our 300+ markets on offer as demand dictates. Simply put, if you’re not happy with a trade you have opened, easyMarkets will bring you out. Sounds like a deal already! But I know that you require a minimum deposit to activate the new feature and it only covers a fraction of the trader’s entire loss. 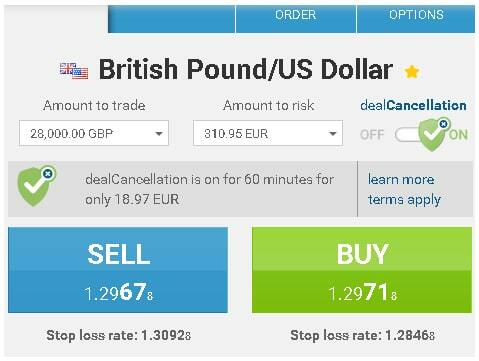 In addition, you charge the trader with a fee of few pips and the cancellation ability is available until up to one hour after opening the trade. Are there any other limitations? There are no limitations to our traders using dealCancellation. All clients with a live trading account have access to dealCancellation with no minimum deposit requirements. Furthermore, the entire loss is covered – so any amount the trader has put into the deal (their margin) is returned to them. Another benefit of dealCancellation is that even in case that a deal hits its stop loss, the full margin is also returned. Imagine it – your trade went wrong, you hit your stop loss and you’re in loss, now imagine how good it feels when your stopped out deal is cancelled. There is a fee that is clearly shown to the trader before they accept and open their deal. The fee, quoted in advance, is based on market volatility which is updated on a streaming basis and can be clearly seen prior to adding dealCancellation to a deal. So the trader has the choice to add dealCancellation or not, prior to opening the deal. Can you describe a few scenarios where traders might want to make use of the new dealCancellation option? There are quite a few scenarios that traders may consider using dealCancellation. New traders afraid of buyer’s remorse, now have the opportunity to try trading with the safety net of getting out of losing deals. More seasoned traders are given the confidence to make bigger deals – push back their stop loss and ride out some volatility. A scenario with market volatility but uncertain direction, a bit like the Brexit referendum. Here’s another example, a technical trader might be looking to catch a reversal at a major resistance level, but if that reversal doesn’t happen, the market might breakout higher due to many stop loss orders being triggered. With dealCancellation our trader is able to cancel the trade should it break out against them. Another potential scenario would be during market overlaps, where the market tends to be more volatile around those times. Using dealCancellation at these times may be very beneficial for the savvy trader. In your own experience what sort of traders could deploy this approach? dealCancellation can be a good fit for all types of traders. New traders looking for a safer trading environment, experienced traders who want to trade bigger volumes, technical traders who like to trade trend reversals or break outs and fundamental traders who like to trade the news. According to your statement, the feature is proving popular amongst the early adopters. How do you measure this? And what is your recipe for traders to make the fullest possible use of this bold tool? Yes, the feature is proving popular for both existing as well as new traders. We measure it at its simplest, by the proportion of traders to total traders who actually use it more than a few times. This proportion is very encouraging so far. We also measure it qualitatively by getting client feedback on their experience using this feature. Our recipe for getting traders to discover all this great tool has to offer comes down to effective communication at all touch points with–emails, the website, trading platform and social networks. We are also focusing on educating our traders as much as possible about this feature with videos and well-informed call centre and support staff. easyMarkets’ innovations in the past have paid off in a big way. The question we have, though, this feature in particular sounds very costly for the company since it also takes a certain risk. What kind of risk management tools did you have in mind for this? Getting the pricing right is important for both the client and for the company. We do our best to make sure the cost is super attractive to the user but at the same time the premium is correctly pricing in the probability of a move. Without getting too technical, we have a great risk management team with years of Option trading and pricing experience who monitor and aggregate delta, gamma, vega and theta exposures and hedge accordingly with external liquidity providers. Excellent. What is next for easyMarkets in terms of offering updates and the company’s overall business? Currently the easyMarkets strategy is fully focused on constantly innovating and improving our users’ trading experience by offering tools that make trading easier and safer. At the same time, we are improving our processes making us more efficient across the whole client journey. In terms of new offerings and updates we have a few in the pipeline but prefer to announce them when we are ready. Don’t you think it is misleading to say that easyMarkets is a ‘CySEC and ASIC regulated forex broker’? This only applies to clients from Europe and Australia. Clients outside these areas, such as in China and the Middle East, contract with the company EF Worldwide Ltd which is registered in the Marshall Islands and is not covered by a regulator at all. Clients can check the ‘Client Agreement’ on the website for confirmation of this if they wish.